Sift the flour and salt into a large bowl. Sprinkle over the oil, and add enough water to make a soft, but not sticky, dough (about 140ml/4½fl oz) – add a little more flour or water if needed. Knead gently until smooth. Cover and leave to rest for about 30 minutes. Divide the dough into six equal pieces and roll each one into a thin circle about the thickness of a 20 pence coin (2mm/1/16 in), using a rolling pin. Brush the bottom third of one of the roti with oil using a pastry brush, and fold the oiled third towards the middle. Repeat with the top third, fold inwards, then turn the roti a quarter turn clockwise and repeat this process with the top and bottom third. Repeat with the remaining five rotis. Leave to rest again. Heat a little oil in a heavy-based pan. Roll one of the roti thinly into a round with a rolling pin, and fry on one side until it puffs up and is speckled brown on the underside. Turn it over and fry on the other side for a few minutes, until it too is puffed and speckled brown. 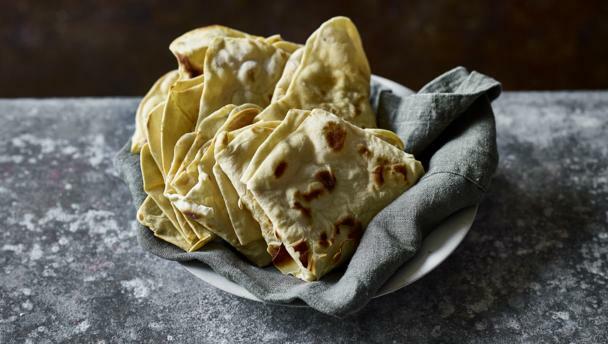 Remove from the pan, allowing the roti to cool for a few seconds, and fold into 4 and wrap in a clean tea towel placed in a colander until ready to eat. Cook the remaining roti in the same way and serve warm.